Recent Digital Single Lens Reflex (DSLR) cameras provide a new opportunity to monitor the quality of the night sky and light pollution. Cameras that able to save images in an unaltered raw format, can be calibrated to get measurements of the luminance of the sky in a physical scale. Then the photo of the night sky can be converted to false colour images, which represents the distribution of sky brightness. In these pictures the colour represents the average amount of light arriving from a small portion of the sky, let’s say from a 1 arcsecond by 1 arcsecond area, given in magnitudes. In this case the unit of the luminance is magnitude per square arcsecond (mag/sqas). Our experiments show that commercial DSLR cameras can easily reach 10 percent precision (e.g. 0.1 mag/sqas), when calibrated thoroughly. 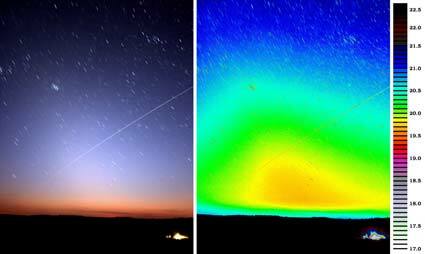 Zodiacal light photographed at the Zselic Landscape Protection Area (left) and the luminance on a false colour image (right). The diagonal line is the trail of ISS. What are needed to took good pictures for night sky monitoring? Beside the camera, a tripod and a remote switch is essential, since long exposures are necessary at dark locations. 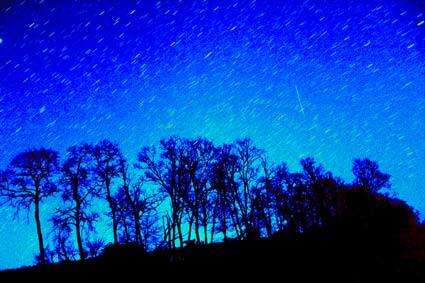 For most of the cameras the longest exposure time, without a remote switch, is 30 seconds. That can be enough in urban locations; but under dark skies at least 3-5 minute long exposures are recommended, even at ISO 800 setting. The histogram function of the camera can help in selecting the right exposure time: the peak in the histogram should be well defined. The widest available lens should be used, to get a large portion of the sky on the image. A fisheye lens gives the opportunity to display the light pollution for the whole sky from a single image. The images should be stored in raw image format. Jpeg files incorporates lots of pre-processing which risks the calibration. For precise measurements dark frames (images with the same exposure but with the lens cap is on) have to be taken, it can be used to compensate for the noise in the sensor and electronics. A couple of dark images can be used for a whole night. Our preliminary results show that omitting the dark image results in a minor error in the luminance. 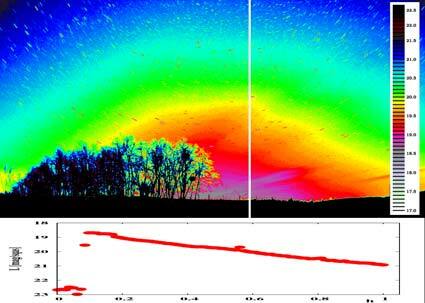 We have started a program to monitor the sky quality of Hungarian national parks and landscape protection areas. In the Zselic Landscape Protection Area we have preliminary results by a Canon EOS 350D camera. In the near future we will start a similar monitoring at the Hortobágy National Park. At both locations we will continue the measurements with circular fisheye lenses. The luminance of the sky in the direction of Kaposvár displayed by a false colour scale. The bottom diagram shows the variation of the luminance along the vertical white line on the image. On the field we compared the numbers reduced from the DSLR images to measurements done by a professional imaging luminance meter. The resulted false colour images agreed to each other with the expected 10 percent precision. We use regularly Sky Quality Meters (SQM) to monitor the brightness of the sky. SQM values correlates well with the average luminance of the pictures taken by a wide-angle lens, when both devices are pointed to the zenith. The typical deviation between the SQM and DSLR measurement is about 0.04-0.06 mag/sqas. We also checked the linearity of the CCD by multiple exposures and different light levels. It is concluded that the raw images of a digital camera can be used for our purposes since the calibration errors do not exceed the precision needed for light pollution monitoring. Changes of weather conditions results in similar or larger errors than the interior error of our measurements. This calibration procedure may be difficult for the average DSLR camera user. But for most of the applications it is not necessary to repeat all of our tests. We plan to make the user friendly “light” version of our software publicly available. Then with a few SQM measurements the predefined calibration of the program can be checked and refined to produce images like the ones in this page. Even if the absolute calibration of the system is not perfect, the method can be used to monitor the changes in local conditions. It would be a good idea to take such pictures during global events, like Earth Hour, to demonstrate the effects of different lighting conditions. A simple comparison of images taken with different snow coverage provides a simple test on the reflected amount of light in winter – just to mention a few possibilities for applications. The edge of the forest – there is only minor pollution at the horizon due to distant sources. False colour image, the different blue tints represent sky brightness between 20.5 and 21.5 mag/sqas.